If you’re interested in technology, you probably know about the annual international exhibition of electronics IFA, which come all manufacturers of both mobile and not so mobile devices. During the IFA 2017 there is, of course, has been the company Samsung. And it brought not only its flagship phablet Galaxy Note 8but also a new version of its fitness bracelet, called the Samsung Gear Fit 2 Pro. About it today, I’ll tell you. At that time, as most manufacturers are trying to occupy at least some space on the market of “smart” hours, the Koreans decided to go a little different route. Yes, they also have “smart” watches, and not alone. But they also decided to make this class of device is more affordable kind of “smart” watches, but with a simpler set of features and with a more democratic price tag. 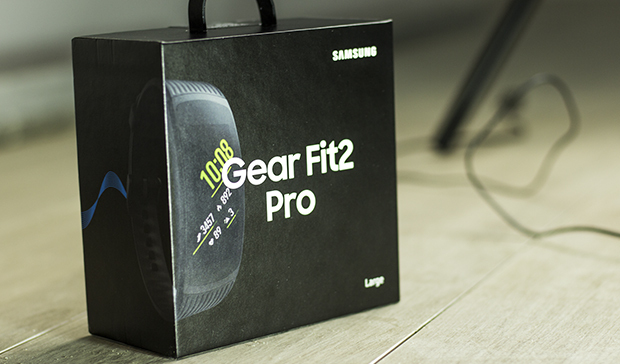 This device is the Gear Fit, 2 Pro. The device is very interesting design. The main highlight of which is the display of the gadget. When you put it on your hand, all you see is the display. This model is equipped SuperAMOLED-display with a diagonal of 1.5 inches and a resolution of 216×432 points. Despite these modest numbers, the display of excellent quality. I’m telling you, as the owner of the watch Huawei Watch. He’s bright, contrasting and quite clear. To discern individual pixels you just do not succeed. On the right side of the gadget there are two buttons. Pressing on the bottom you are taken to a menu where you can not just go settings, but also to run the desired application. The top button is responsible for the action “back”. More on the Gear Fit 2 Pro has no controls. If you though time in life saw the original version of this bracelet, we can say that you are familiar with the new generation. One of the differences is that now packaged straps the standard zip, as many users have complained that the clasp on the ground, the Gear Fit could pop open at the most opportune moment. I want to note that when you purchase be sure to pay attention to the size of the bracelet. I have visited on the test size Large, which corresponds to the inscription on the box. There is also a size “Small”. So how about the display I already told you, let’s discuss other features of this gadget. Heart of the device is proprietary Exynos 3250 chip which runs at a clock frequency of 1.5 GHz. Helps to run the CPU 512 MB of RAM, which for such a device lacks balance. If you wish to download on the Gear Fit, 2 Pro your music, then you will have up to 4 GB of flash memory. Out of the box you are only available about 2 GB, the rest is occupied by the operating system. Also, this device is equipped with various sensors, including Wi-Fi, Bluetooth 4.2, accelerometer, barometer, gyroscope and heart rate sensor, which is located on the lower lid of the gadget. As expected, this bracelet under the operating system Tizen OS. For such a small display system is optimized pretty well, although there are some flaws with the disappearance of the word endings or transfer of syllables. I wore this device for about a week and managed to make some conclusions about his work. Let’s start at the beginning… when you first turn the bracelet will prompt you to download on your smartphone the Samsung Gear application, then you’ll have to download a special plugin that is called Gear Fit Plugin. But do not be afraid, all this “tells” the smartphone, so that even search is not necessary. The first configuration was pretty quickly that I was very pleased. A few clicks “next” and sync finish. All bracelet can be used. Then you can already proceed to the customization of the bracelet, of course, due to the choice of different dials. Of the pre-installed there are 14 dials, others you can download via the proprietary Samsung Galaxy apps store Apps. Since I own a Huawei Watch, I noticed one peculiarity. Even in the app store from the Koreans there is no dial from third-party developers, while Android Wear everyone can afford to choose exactly what he likes. But as for me, it is an improvement. As it still a fitness bracelet, it is able to distinguish between different types of loads, including: running, swimming (Yes, in the wristband you can swim), sit UPS, crunches, yoga, Cycling and many others. And as you may have guessed, all data is synchronized with a proprietary app Samsung Health, which also need to download. As for the heart rate sensor, you can either manually measured or a bracelet will do it automatically. What I really like is the fact that for measuring the heart rate band doesn’t need to tighten the arm very tightly. Dressed as you are comfortable, and the bracelet measures the pulse. Beauty! Well, since it’s still “smart” bracelet, let’s talk a little about the notification. The vibration of the bracelet is quite nice, you will hear it even if the bracelet under his jacket. Sync with your smartphone is very fast as soon as the notification appeared on the smartphone, it immediately appears on the bracelet. It can not but rejoice. Android and Tizen OS understand each other perfectly. Loved that the bracelet all the time, tracks your activity. So, after 30-40 minutes of typing at a laptop I see a notification with the text “it’s Time for exercise!”. Thinking about skipping, but then for some reason changed his mind and began to make five turns of the case standing, who considered himself a bracelet. The prefix “Pro” in the name of the model for a reason. The fact is that Pro bracelet is completely waterproof and can withstand immersion under water to 50 metres, without time limitation. That is why the firmware there is another form of exercise — swimming. Putting the length of the pool and forward. The bracelet and the distance will count, and heart rate will be measured. Samsung Gear Fit 2 Pro has a battery capacity of 200 mAh. The assurances of Samsung, this should be enough for 3-4 days of work without recharging. But as expected, the reality is not so rosy, though not really bad. The biggest energy consumer are notice. If you lead a very active life in social networks and take a lot of calls, in the best case, the bracelet will stay two of daylight. With my usage scenarios, the battery of the bracelet to the evening showed 25-30%. Bracelet Gear Fit 2 Pro complete dock! The bracelet charges very quickly. So, from 0 to 100% via the USB port of the laptop is the bracelet charged in just over 1 hour 30 minutes. If you charge it from a charger with a large amount of output current, the charging time is very reduced. As the bundled charger has a special docking station. Fitness bracelet Samsung Gear Fit 2 Pro is a great helper for those who are always watching their health. Yes, the appearance of “the Amateur”. Under the suit they will wear will look ridiculous. Although, if I didn’t have my “strict” Huawei Watch, maybe I would think differently. Gear Fit 2 Pro compared with Huawei Watch! Display excellent quality, adequate functionality for monitoring health and physical activity, a price tag of about $200. It may seem a lot, but are there any other gadgets with the same price tag and the same rich set of features? You are reading an article on the Review fitness bracelet Samsung Gear Fit 2 Pro. All materials on the site Gadgets F, а также и статья Review fitness bracelet Samsung Gear Fit 2 Pro - written for the purpose of information enrichment and we are happy if you like our magazine.